Following the introduction of its commercial robots in 2017, LG Electronics is pushing the envelope with the three new work robot concepts. The new concepts, specifically developed for commercial use at hotels, airports and supermarkets, reflect LG’s commitment to expanding its position as the leader in development of products utilizing artificial intelligence (AI) through deep learning. The concept prototypes were unveiled at CES 2018. 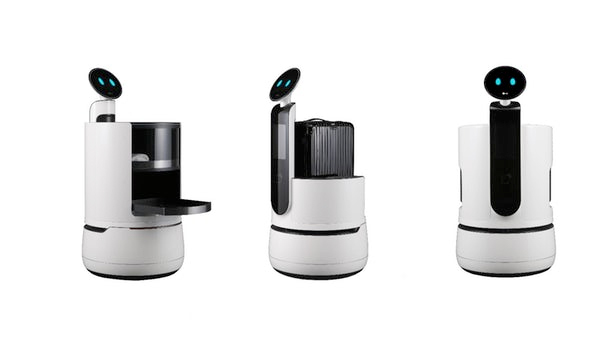 Under LG’s new “CLOi” (pronounced KLO-ee) robot brand, the CLOi serving robot, CLOi porter robot and CLOi shopping cart robot follow in the footsteps of the CLOi airport guide robot and the CLOi airport cleaning robot. The airport robots are already deployed in a trial at South Korea’s Incheon International Airport, and they will take on the thousands of visitors that travel through Seoul on their way to Pyeongchang. Also part of the expanding CLOi family is the CLOi lawn mowing robot, and the CLOi hub robot which recently participated in a trial at one of Korea’s largest financial institutions by providing information and servicing customers at the bank’s branches. The CLOi serving robot will deliver food and beverages to guests of hotels and visitors to airport lounges quickly and efficiently. Customers will experience intuitive interaction with the robot as they remove their items from the robot’s built-in sliding tray. When the delivery is confirmed, the serving robot will make its way back to the kitchen on its own. The CLOi porter robot will help minimize inconvenience for travelers by reducing slow service and long wait times at hotels. This robot can facilitate express check-in and check-out service by handling payment and even delivering luggage to a guest’s room or waiting vehicle. The CLOi shopping cart robot includes a barcode reader that customers can use to scan items and view product prices as they’re placed within the robot’s bin. The robot’s “face” will also display all items on the shopping list and through a smartphone app will guide the customer through the store via the most efficient route. Just imagine. After being served your lunch in the airport lounge by an LG robot, you arrive at your favorite business travel hotel and are greeted by an LG robot that checks you in quickly and carries your suitcase up to your room. You turn on your room TV, an LG Pro:Centric model, and order room service directly from the TV. A short time later, an LG robot arrives at your door and delivers your order. When your trip is over, an LG robot in the hotel lobby assists you with express check-out and also carries your suitcase to the car waiting outside. Finally, you arrive at home and see that you need a few grocery items for dinner. You go to the supermarket where you are escorted by an LG robot that speeds your shopping experience and carries your items so you don’t have to push a cart. No tips required (how would you tip a robot anyway?). Life’s Good with LG.